Mt. 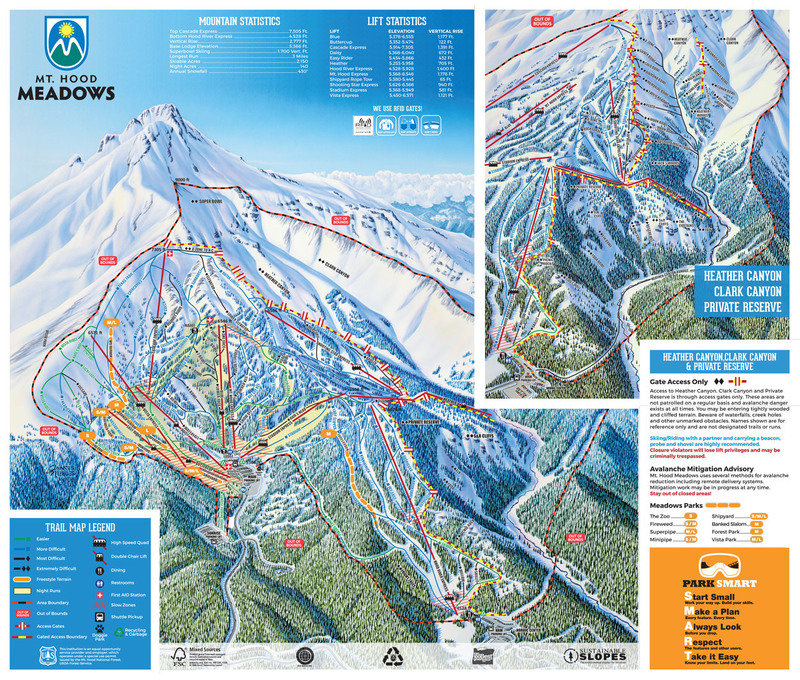 Hood Meadows is the largest resort in the Portland / Mt. Hood area, and the 2nd largest in the state. 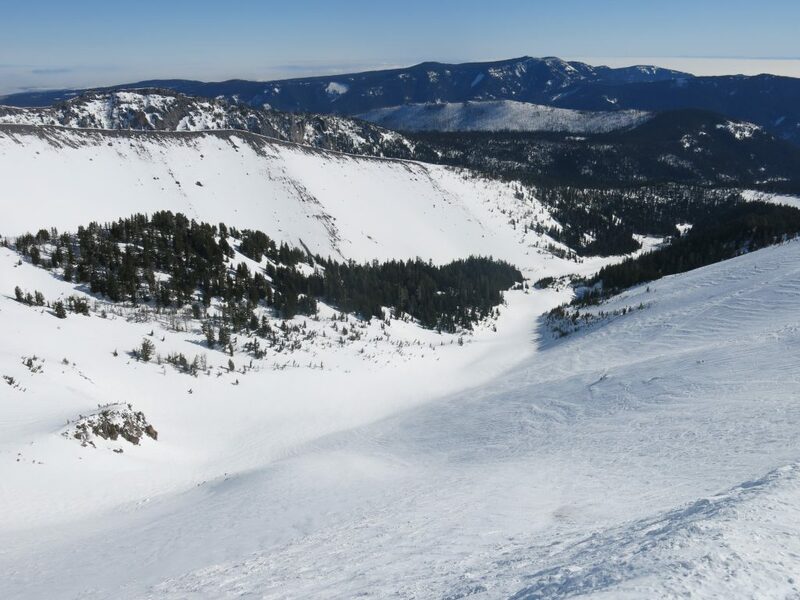 Although it has a huge amount of natural snowfall, great variety of terrain, and a modern lift system, it’s not really on the radar of many people as a destination resort, so serves mostly Portlanders and people from other northern Oregon towns. 2017 was a year that a record number of atmospheric rivers hit the west coast, resulting in the wettest water-year in history in Northern California, and the near failure of the largest dam in California at Lake Oroville. We were dodging subtropical moisture and rain which was about to inundate Tahoe when we started our 2-week trip up to Canada. There was a window of good weather before the rain hit Oregon, so we stopped at Mt. Hood on the way up. It was a bit warm when we skied Mt. Hood Meadows on the first day of our trip. This is not unusual for the area and freeze/thaw cycles are common even in the colder months of January and February. There was more than enough snow depth and conditions weren’t awful, so we were able to ski most of the resort, even venturing off-piste. The base lodge and main parking lot are actually part way up the skiable terrain, but not really mid-mountain. The parking lot was literally a sheet of ice and it won the award for the worst parking lot of our 16/17 season. Out of the base area most people will head up the Mt. Hood Express. This really had the best terrain on that half of the mountain, with some good steep groomers. 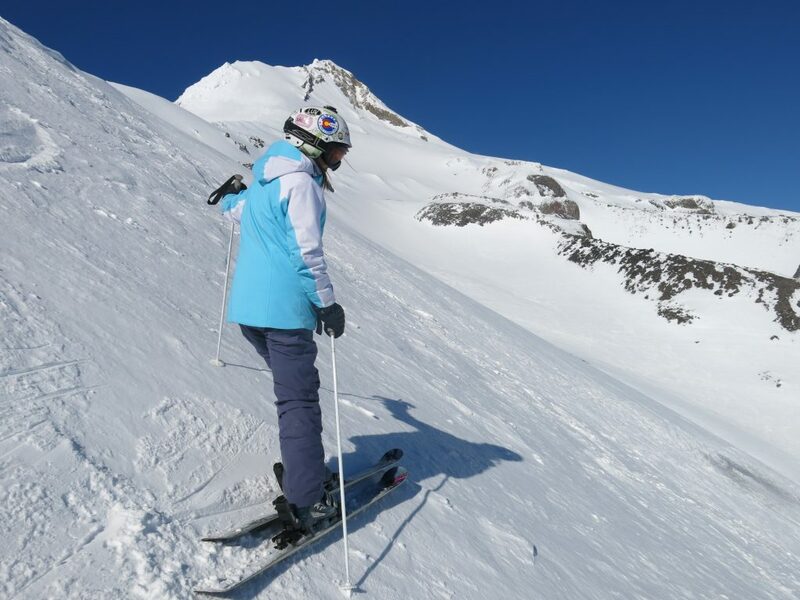 We spent a lot of time exploring that lift and skied just about everything it had to offer. 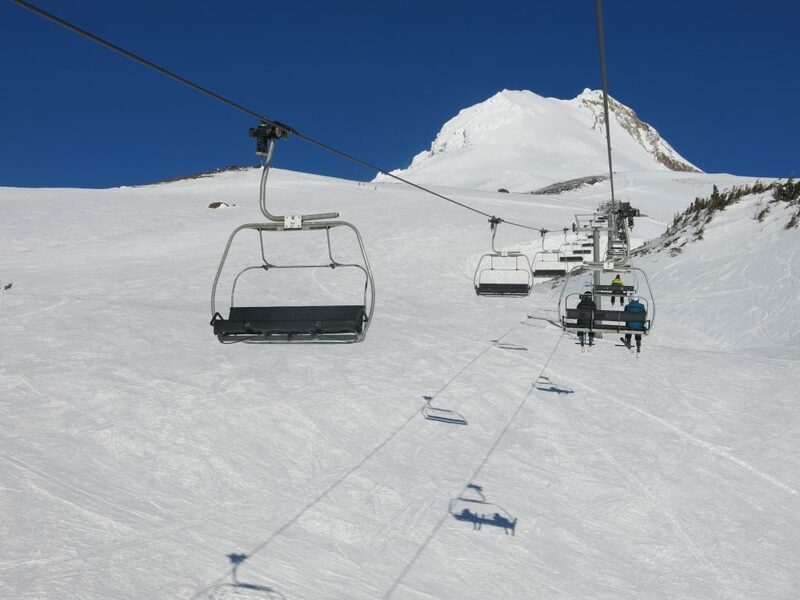 Above that, the Cascade Express goes up to the highest lift-served point at 7,300 ft. The view up there looking up to the top of Mt. Hood is amazing. It looks like it’s really quite close, but it’s actually almost 4,000 more vertical feet to the top. There are no trees above the top of that lift so there’s nothing to lend perspective. The terrain on that lift is decent, but not very steep and it’s all very similar with easy blue groomers for the most part. Further down to skier’s right is Vista Express but we took only one run there because it’s so flat. Almost everything on this mountain faces southeast, so gets the full effect of the sun and it was really warm so it was almost like spring skiing late in the day. We were looking for some more shaded aspects for off-piste skiing. From the top of the Cascade Express you can traverse over to the upper gates into Heather Canyon. 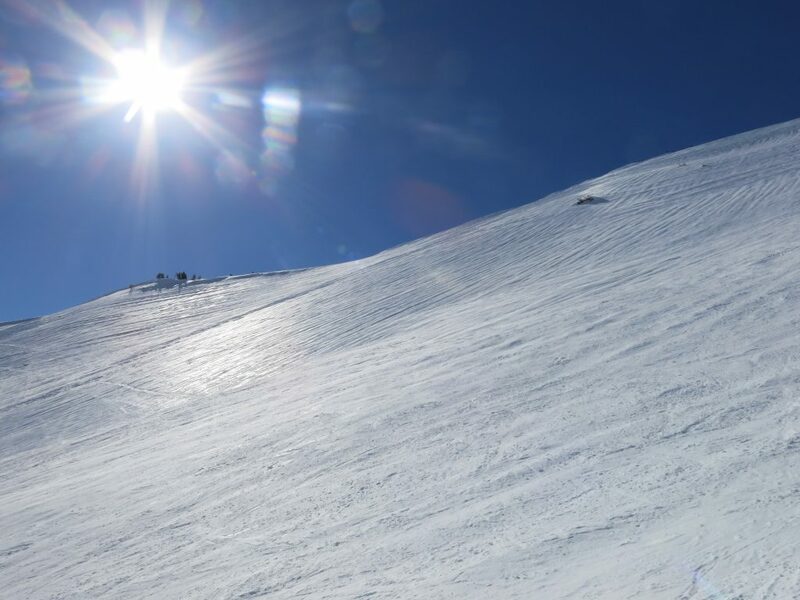 We did that a couple of times because it’s really great terrain and had the best snow off-piste. Everything else was iced up, but there was some chalky snow in there in spots due to the northeast exposure. 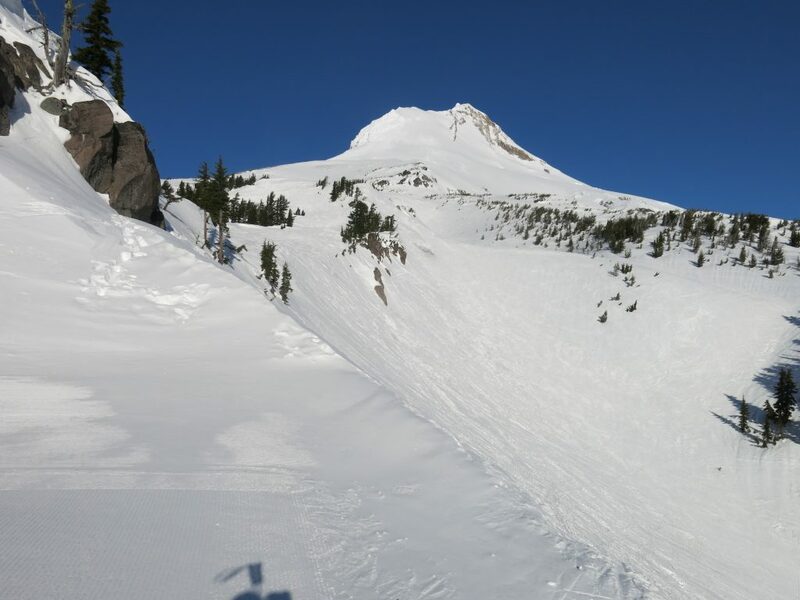 The caveat is that it’s a LONG glide out of there once you ski the steep stuff at the top. Then it’s 3 chairs to get back up to the top, so enjoy it because you won’t be doing a lot of those in a day! 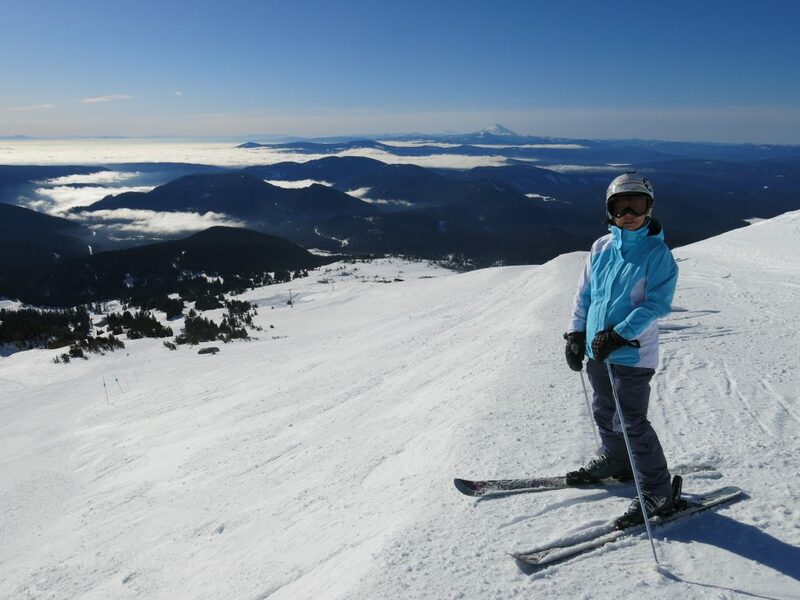 The Heather chair is a slow double and it serves some of the steepest terrain on Hood. It’s also mostly north facing and this would be a great chair on a powder day. Alas, the conditions down there weren’t really skiable but it looks pretty awesome. Once back up to the top of the Heather chair, you can ski down to the Shooting Star express. 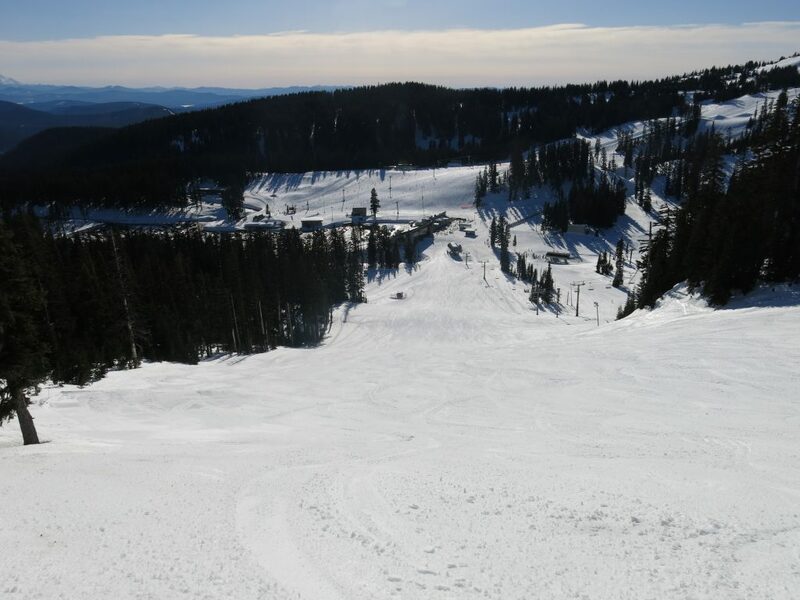 This was a fun zone with some easy groomed blues, but it’s a bit short on vertical drop. Better is the Hood River Express. 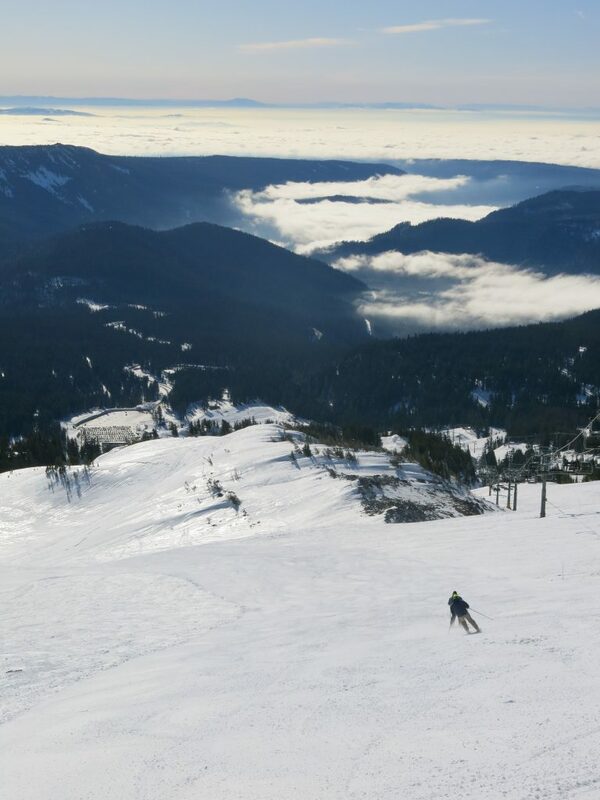 This chair has some great vertical and steep groomers. We skied everything that was groomed on that chair twice because it was really great terrain. 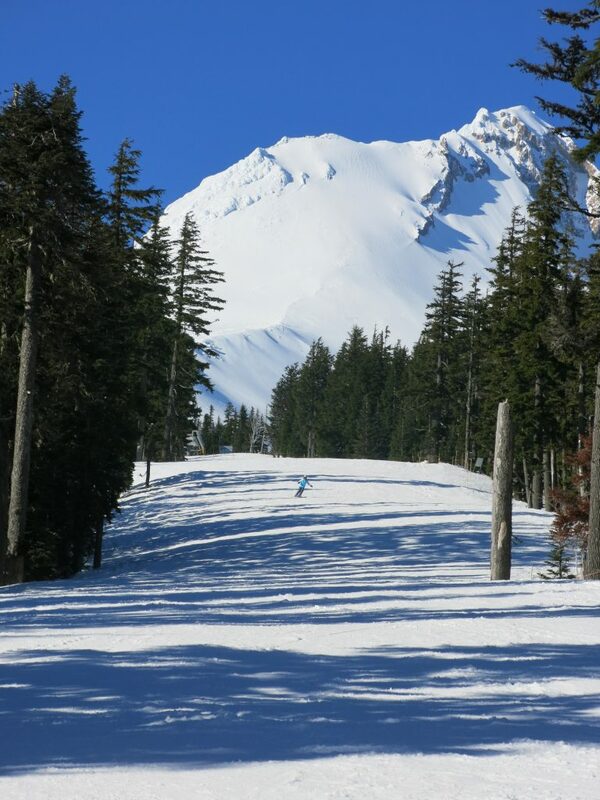 The runs wind down through the deep tall trees down to the lowest point of the resort. We had a good time and stayed until closing. Late in the day we hung out at Mazot hut which serves food and drink. That seems to be the place to be at the end of the day and it was a fun crowd enjoying drinks, views, and sun. It took us a long time to get the timing right on this resort. We just barely squeaked in two days on Hood between either massive snow storms with high winds or massive downpours of rain which happened the day we left. It’s a fun place when conditions are good, but it’s mostly locals that will be able to catch those. It’s a bit too risky planning a trip there, but if you are in the area and it’s good weather give it a try.